We are Ellen Philippen and Lotte Porrio, the Oogst (Harvest) goldsmiths. In our boutique, in the heart of the Amsterdam neighbourhood the Jordaan, we create handmade jewellery and one-of-a-kind custom pieces. 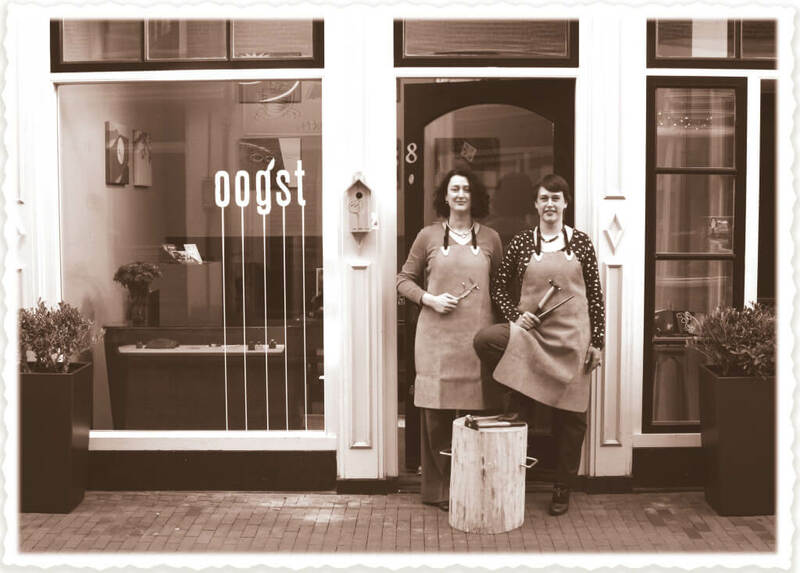 Oogst was founded in 2008. We quickly grew from a studio to a shop. The graphic signature of Lotte’s work and the floral & elegant creations from Ellen; together we are Oogst. More background information about us, the Oogst team, and our craft you can find in our biography. The inspiration for our Oogst collections is everything that grows and blossoms. Our yearly harvest – Oogst – is a series of one-of-a-kind pieces created around a special source of inspiration. Inspired by the beauties in nature, a Brothers Grimm fairytale, a Collection of Curiosities, the authentic Japanese treasures in the SieboldHuis Museum, the Wiener Werkstätte, fabric patterns and the Amsterdam Hortus. Discover more about the themes of the previous Oogst collection designs. In our beautiful spot at the Tweede Tuindwarsstraat in Amsterdam, we combine our studio with a boutique. We enjoy showcasing our work and craftsmanship at the exact place where our jewellery meets their new owners. At Oogst we work with recycled gold and conflict free diamonds. You are also very welcome to bring your own gold or precious stones to the studio for us to work with, to upcycle them into a beautiful new piece. The world is discovering the Oogst jewels and wedding rings and we are very proud of this. See our pieces featured in the press here. Want to keep posted on our fresh-from-the-workbench jewels or other news follow us on Instagram, Pinterest or Facebook. or sign up for our newsletter via info@oogst-sieraden.nl! We are happy to have you over at the boutique to advice you about your new Oogst piece or to discuss your wishes for your own custom Oogst design. Make an appointment and have your dream jewel made.